Bike-Sharing Has Landed in Milwaukee with Bublr Bikes | Hupy and Abraham, S.C.
On August 6, dozens gathered at Red Arrow Park in Milwaukee to hear an update on bike-sharing. At the press conference, the new bike-share program called “Bublr Bikes” was unveiled, along with the first 10 station locations. Bublr Bikes will offer bicycles for rent from an automated kiosk and can be returned at any other station. The starting rate will range from $7 per day to $20 per month for unlimited trips under 30 minutes each. Additional charges would apply for longer trips. The project was a result of last year’s success from a single bike station near Discovery World. This station generated over 1,000 rides without any marketing efforts or other bike stations. 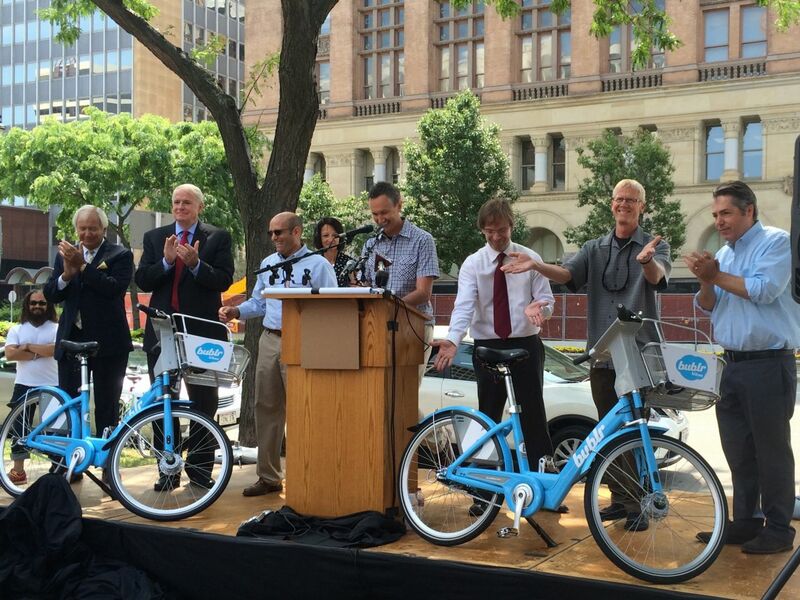 Bublr Bikes revealed at Red Arrow Park in Milwaukee! Bike-share programs have been increasing in popularity throughout the United States in cities, including Chicago, Minneapolis, Des Moines, Houston, Indianapolis, Madison, New York City and more. Bublr Bikes will place Milwaukee on this growing list and raise excitement for people in the city. Kevin Hardman, the launch director of Bublr Bikes, said that over 28 local companies and donors came together to raise over $1 million for the project, along with $2 million raised by the company Midwest BikeShare. An additional 25 to 35 stations with 200 to 300 bikes will be available next year. The company wants to achieve a 1,000-bike network, but an additional $3 million needs to be raised. Bublr Bikes plans to expand to surrounding communities like Shorewood, West Allis and Wauwatosa with more funding. This expansion would make the bike-share system a regional asset. Inspired by the Milwaukee community, the company name comes from bubbler, Milwaukee’s name for a drinking fountain, and the city’s proximity to the lake and other bodies of water. With this new bike-share program sprouting in Milwaukee, Hupy and Abraham, S.C. would like to remind everyone to watch out for cyclists. Contact the firm to receive more information on bicycle safety, and if you or someone you know has been injured because of a bicycle accident, please call one of our attorneys today.